Non-fiction – Kindle edition; Brow Books; 244 pages; 2018. However you choose to describe Axiomatic, I think it’s fair to say it is not easy to box in: it doesn’t fit a genre, seeing as it’s a heady mix of storytelling and reportage. To my mind, these pieces (or chapters) wouldn’t be out of place in a “high-brow” magazine — for instance, a colour supplement that comes with a weekend broadsheet — and as such I’d class them as journalistic features. I’m not going to review each chapter other than to say there are common themes running throughout Tumarkin’s work. She is very much focussed on time and how its passing can shape the past, present and future. She looks at its impact on the personal and the political, how it shapes our understanding of ourselves, our families, our popular culture and our institutions. But she looks at very dark and disturbing subjects to do this — from secondary school students who commit suicide in the brilliant opening chapter, which is one of the most thought-provoking pieces I’ve read in a long while, to a child holocaust survivor accused of abducting her grandson and hiding him in a makeshift dungeon, which reads like something that fell out of a literary crime novel — and always with a keen eye on intergenerational trauma, the moral necessity of protecting children, love, grief and survival. This is the story sentenced to constant retelling, about how people are born into things, and fate thinks intergenerationally. Parental pain, sadness, abuse (be it suffered or inflicted), indifference, withheld love, riding and exploding over children’s lives, like tanks. All the while Tumarkin writes in gleaming, silky prose, using a mix of short sentences and longer ones, creating a rhythm that is both hypnotic and alluring. In all cases, she inserts herself in the story, and while she’s clearly her own person, with her own style and her own voice, there are echoes of Janet Malcolm and Helen Garner in her work. 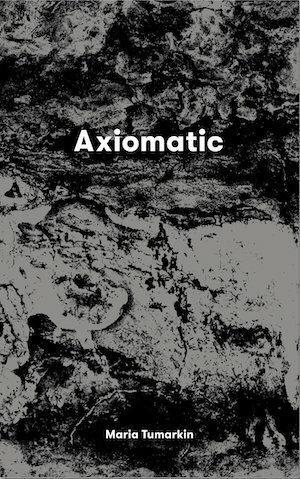 Axiomatic is the kind of book that deserves a wide audience, not only because it deals with challenging subjects in a thoughtful, considered and wholly original way, but also because it is a timely reminder of our own humanity and our own resilience. This is a five-star read for me. This is my 7th book for #AWW2019 and my 6th for the 2019 Stella Prize shortlist. This one is currently available as an ebook in the UK.